It was a getaway I was eagerly looking for when my friend invited me to Belgaum. I accepted the offer and was eagerly looking forward for the same. Though the trip was planned almost weeks in advance, a ride back home was always on my mind and being a fan of buses a numerous operators was already striking my mind. A week before my travel, a huge hoarding outside my office grabbed my attention. 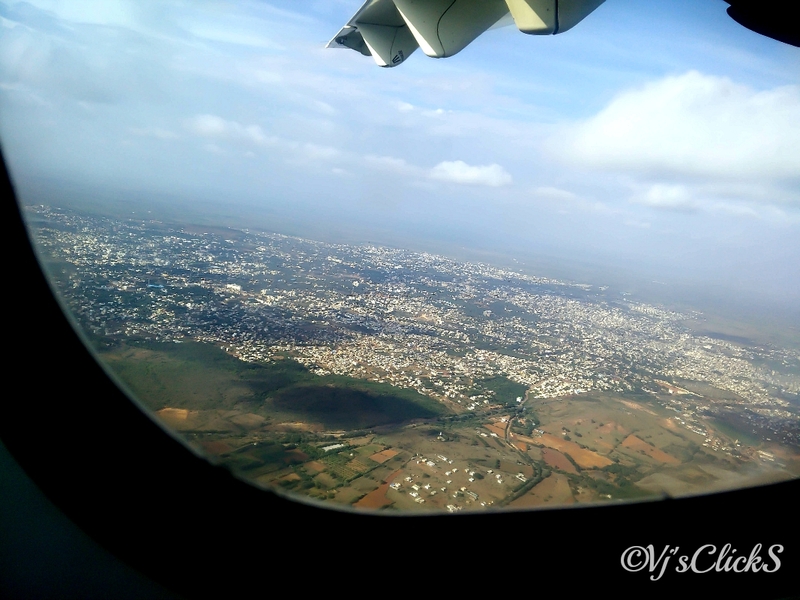 The hoarding was advertising about Air Pegasus starting their second flight to Hubli to Bangalore. It did not take too long for me to decide my ride back home. Air Pegasus is amongst the newest airline in India. 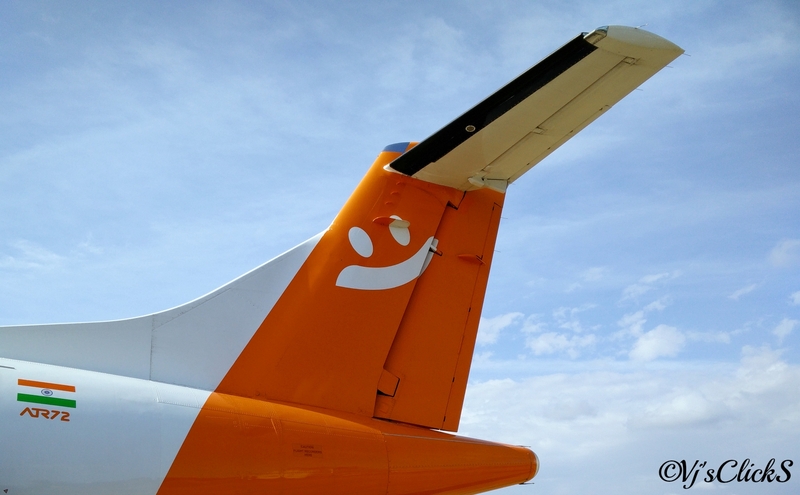 It is a subsidiary of Decor Aviation, the largest ground handling service provider in South India. 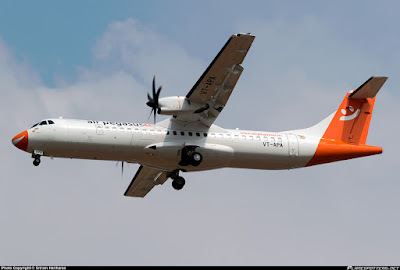 Armed with ATR 72-500 aircrafts, they commenced operations on 12 April 2015 with its inaugural flight between Bangalore and Hubli. After taking a quick look on their website, I decided to book the 16:40 flight from Hubli. 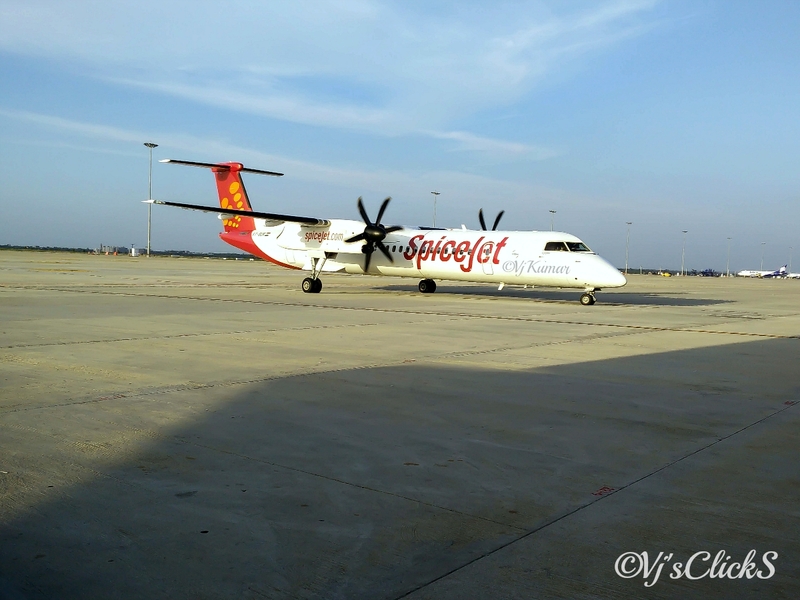 A lot of questions were on my mind about their service, load factor and the biggest and the jittery of them all- A Turboprop experience..!! After having a heavy meal, thanks to my friend Prashant it was time to head towards the Hubli Airport. The airport is located a mere 3kms from his place. After bidding adieu, I headed inside the small and cosy Hubli airport. I checked in my bag and picked up my boarding pass. The lady at the counter asked me if I had a seat of choice and I was quick to choose a window seat. While I headed towards the security checks, the final call for check in and security was announced on the PA system. A small room housed both the security as well as the waiting room for the passengers. I cleared the security check and settled down on the seat overlooking the runway. A quick look around revealed around 40-45passengers waiting to board the plane. The passengers were mainly localities, few tourists and few from business fraternity. Another 15minutes passed by with few more adding to the list of waiting passengers. At around 4:15pm, the aircraft from Bangalore arrived. The plane had brought around 45 passengers from Bangalore. Not bad for a weekday load. The PA system came alive and passengers were requested to head for boarding. I decided to stay back till the queue subsided. Finally, I decided to head towards the awaiting plane. My boarding pass was checked and I headed out towards the awaiting plane. A sheer noise of metal being cut grabbed my attention. A quick look towards my left revealed the ill-fated Bombardier Q400 which skidded off the runway upon landing in March being scrapped. Back to my airplane, I noticed the aircraft which was in operation was VT-APA. 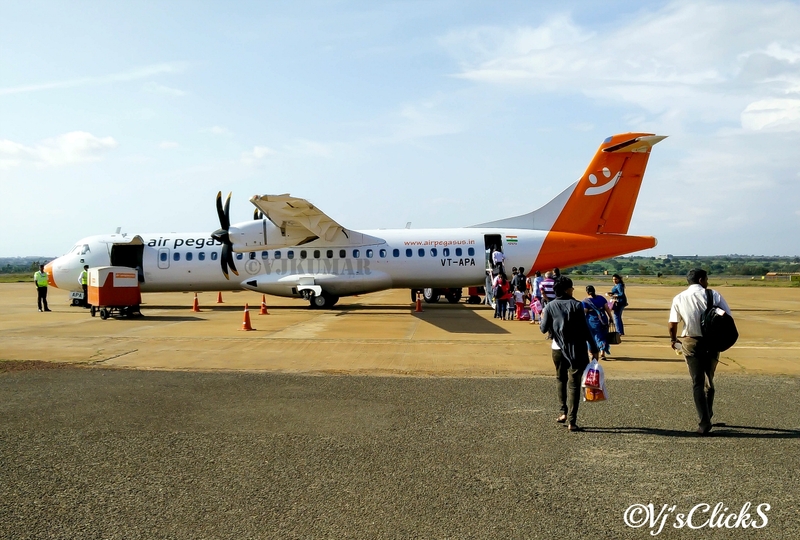 A quick search about the history of the plane revealed that it started its operation as VT-KAA of Kingfisher almost 9 years ago. There were two crew members on the plane, while the first crew member welcomed us on board and was busy assisting the senior passengers in boarding; the second crew member was guiding the passengers to their seats. The crew had done a great job to prepare the aircraft for the return leg of the journey as they had very less time. The cabin was very well maintained. I took my seat and waited for the take off which was now just moments away. The seat next to me was empty. Boarding finished at 16:35pm and the doors were armed. The flight wasn't full but not many seats were empty. The Pratt & Whitney Canada PW127FM engines came alive and within no time we started to taxi towards the end of the runway. The crew went ahead with safety demonstration and finally we were airborne at 16:42hrs. The take off went very smooth and made some quick turns before heading towards South. The seatbelt sign was turned off and within minutes the cabin crew came by with trolley to offer snacks. I picked up a Paper Boat, something to keep me accompanied. The crew was very patient and served every passenger with a smile. 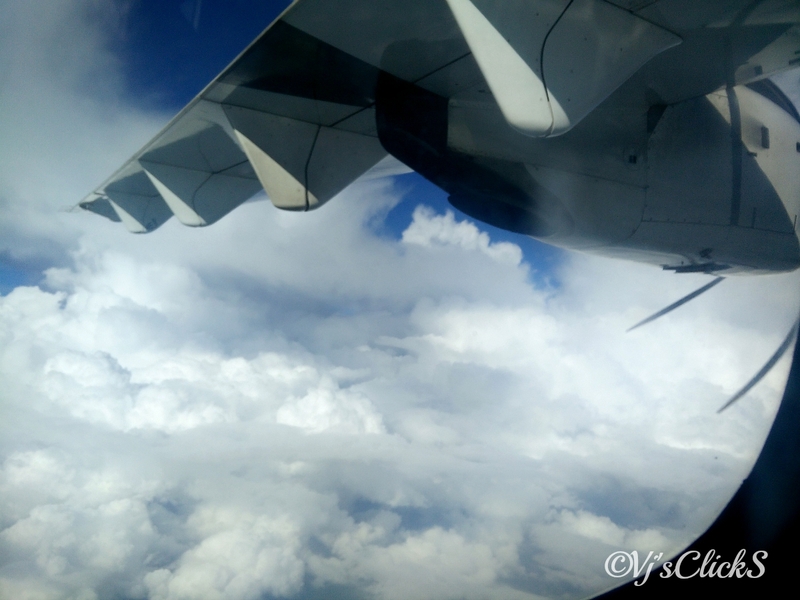 The clear blue skies outside however was very mesmerizing and it kept me glued to the window. The seatbelt sign came back on at around 17:30hrs and we made some more turns and lined up for landing. We hit a small pocket of turbulence but nothing severe. We began to descend and finally touched down at 17:40hrs on Runway 27 and headed towards our parking stand. I could see a couple of Cobus 300 heading towards us. I came out of the airplane and found a Spicejet Bombardier arriving from an unknown location. I boarded the waiting GlobeGroundIndia and headed towards the terminal. The baggage took quite some time to arrive. I was out of the airport by 18:25hrs. This was my first Turboprop experience and I must admit it was simply amazing. Yes, these planes are known to make more noise, but the sound inside the cabin was very low. The service from Air Pegasus was also outstanding. Full marks to the crew who served the passengers with a smile and never once were they angry or rude when they were repeatedly called for service. Being a short haul flight this is a definite try as it saves a lot of travel time between the two cities. Nice post about your trip experience. The picturesque Unkal lake and an ancient temple of Chalukya empire, are two of the many beautiful and extravagant location in the city of Hubli. Like many of the cities in Southern India, Hubli is also an important textile centre. Check out more about Hubli tourism.